Living the Cheapskates way isn't about deprivation. Saving money can take a toll on you and your family so it's important to plan your own rewards. Having places you can eat out that don't cost a fortune, local places you can visit for a day out that are inexpensive, and small luxuries or treats you want to buy that you can save for will make the budgeting a bit easier. Build a "rewards" category into your spending plan and add to it regularly. It doesn't have to be much - $5 a week will give you $260 a year you can use to splurge without worrying about how it will affect your budget. How does this save money? By having a list or idea of things that are inexpensive for rewards, it will make it less likely you'll spontaneously splurge on something expensive. 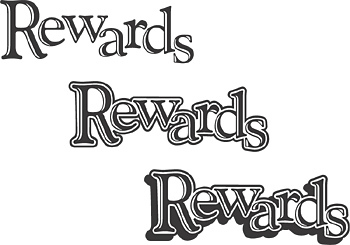 Planned rewards is splurging without the guilt! On the topic of rewards. Just wanted to share a reward system that others could utilise. We moved to our current home about 14 months ago and I shop at the local Coles. They always ask if I have FlyBuys which I don't. I usually spend $50-80 a week on groceries so after 14 months this could have accumulated points that could have gotten me/us something special or a "reward" for free. I've now applied for my FlyBuys card.